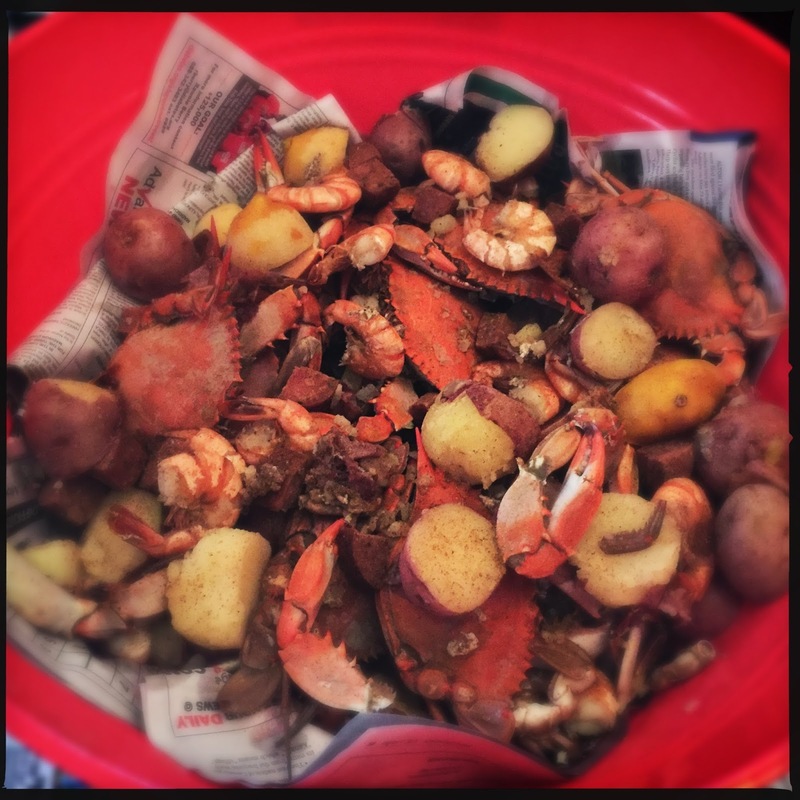 I've been wanting to cook crabs at home ever since I went to Florida in April 2014. I was so excited to eat at a crab shack during that trip, but we drove 45 minutes just to discover that they hadn't caught any crabs that day. 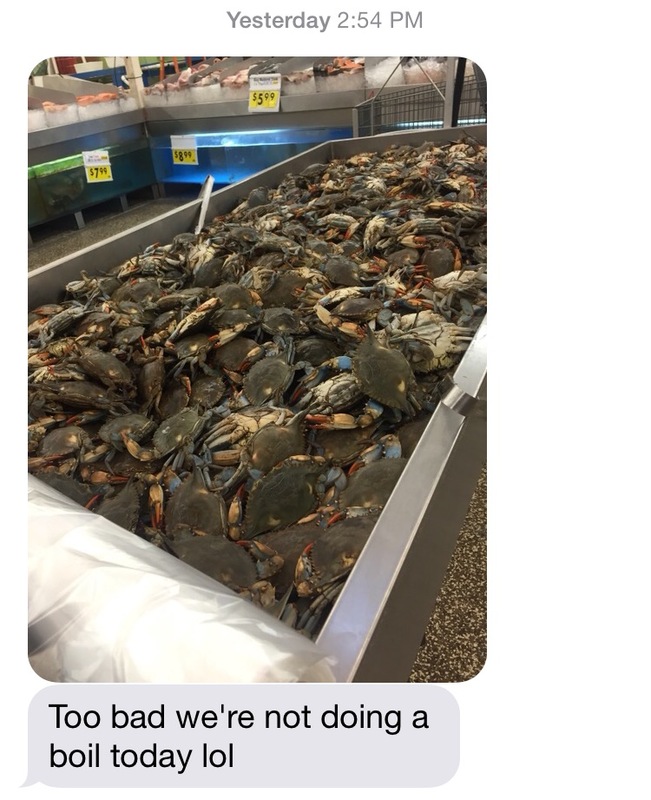 No worries, I thought...I'll buy some live blue crabs at Seafood City when I get home and have my own boil. Sadly, if the Florida fishermen aren't catching any crabs then there will be none in St. Louis either. Cut to earlier this year: My friend Theresa and I decided we were going to have a crab boil one spring afternoon...but there were only two, pathetic, disabled crustaceans left in the bin. We ended up having dinner at Peacemaker Lobster & Crab Co. instead. But wait. "We could totally do a boil today," I replied. And so, Theresa showed up with 5 pounds of blue crabs, some tiger shrimp, and red potatoes. I supplied the giant stock pot, boil seasoning, lemons, andouille sausage, and beer. It was hard to pick them up...they kept striking out at my tongs, kept grabbing ahold of the tongs, the bag, each other. I ended up getting out the long BBQ tongs to avoid injury. We didn't follow much of a recipe: I filled a large stock pot with water about 1/4 full, added a ton of crab boil seasoning and some halved lemons. When that boiled, we added the potatoes & let them cook 5 minutes. Then, we wrangled in the crabs and boiled them (with the lid on) for 10 minutes. Next, we threw in some andouille cubes and the shrimp, let that cook for 1 minute, then turned off the heat and let it sit with the lid on for 5 more minutes. 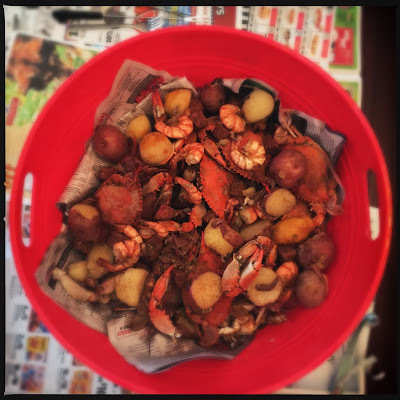 We scooped everything into a newspaper-lined bucket and put it on a newspaper-lined table with ramekins of melted butter, a tin of Old Bay seasoning, small forks, butter knives, and a hammer. Ah, the hazards of eating well! Big yum on that crab boil!